From the second I picked up the controller to the moment the credits rolled, I was fully engaged with this game. It might not be long, but every "minute" was a joy to play. Let's dive a little deeper, because this really is a game worth your attention. Minit plays like a new version of the original Legend of Zelda for the NES. It's a simplistic top-down adventure game, with a large open map and a multitude of items hidden throughout. There's a little combat, but the focus never drifts from exploration. Once you pick up the first key item (a cursed sword), Minit's primary gimmick kicks in; every 60 seconds you die, and respawn at your house. This really amps up the urgency, making me hit the ground running on every fresh start. Items gathered are kept, as well as other world changes, so it's not nearly as punishing as it sounds. Overall, the controls of the game were perfectly simple. You move with directional buttons, swing your sword with A, and can opt for a swift end to your mortal existence with B (a useful option when you've got 20 seconds left but need something 40 seconds away). That's it. You don't even have to press anything to talk to NPCs; they simply start spitting out dialog once you approach. The simplicity of the controls once again kept me in the action. No time was wasted memorizing new moves, or thinking which button did what. It kept me locked in an addictive gameplay loop. Speaking of gameplay loop, oh boy is this one addictive. It's the most literal loop I can think of, since every minute you're flung back to the starting point. There wasn't a single death I didn't immediately want to pick up and keep playing. It was straight-up addictive, holding my attention the entire time. Despite constant death and rebirth, Minit doesn't play like a roguelike. In fact, my only "complaint" is the gimmick of a one-minute timer isn't as important as you'd expect. You find items scattered about that open up new routes and areas, such as the sword that let's you cut bushes or a cup of coffee that let's you push blocks (you know, as coffee does). These are kept on death. In fact, most changes you make in the world remain—bushes will regrow, but that island machine you restored power to will remain operational each time you come back. This isn't like Majora's Mask, where the world really does loop. Honestly you could remove this gimmick and the game wouldn't change much. That's not a bad thing, though, because Minit is darn fun regardless. It feels like classic Zelda, but obtaining new items to unlock areas is reminiscent of the Metroidvania genre. The world opens up in manageable chunks, and has just enough variety to keep my interest. Supplementing the key items, you can also find hidden hearts that boost your health and coins that can be exchanged for goodies. Neither of which feel essential but they are a great incentive to explore, and most are hidden in clever places. There are also several new "homes" to find. Entering one of these changes your respawn point, and this is a great feature to help you explore outside the limited space around the starting area. You can even hook them up with nifty teleports, allowing you quick access to all corners of the map. Minit isn't very long. My first play through took just about an hour and a half. And you know what? That was perfect. It may not have been a Witcher length epic, but I wasn't bored for a second. I walked away feeling that was time very well spent. 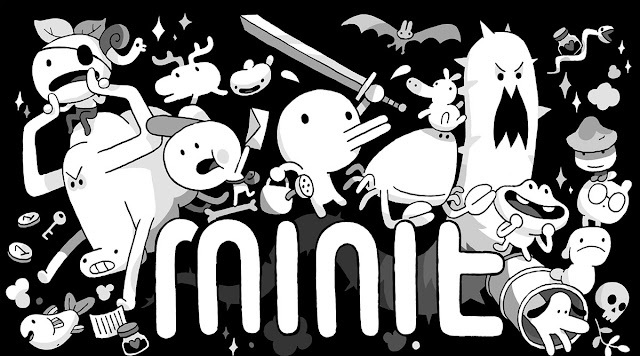 Don't let the length put you off; if you like exploration, Minit is great entertainment. Here I'm talking about more than graphics, but how the game was designed overall. But let's get art style out of the way quick—Minit has ultra-minimalist graphics but plenty of charm. Despite the whole game being two colors (solid black or solid white), it packs plenty of charm into every pixel. This isn't the best looking game by any means, but it embodies the philosophy that sometimes, less really is more. More important than graphics is the world design, and I find this to be Minit's strongest point. The world is tightly built, with good design choices on every screen. Like I said before, there is no map or quest markers, but everything was designed in such a way you don't need either of those. The world layout is memorable enough to keep track of where you are. NPCs give hints about where to go that are just cryptic enough that I felt clever when I figured it out. When possible, I like to play games without the help of a walkthrough. As a rule of thumb the less I have to look something up, the better designed I feel the game is. But I don't have limitless patience, so if I get stuck you better believe I'll turn to the internet to get back to the fun stuff. While playing Minit, I only hit that snag once; the rest of the time the game gave me just enough info to progress. To me, that's a sign of very good game design. Although short, Minit is a game without filler. It is fun start-to-finish, and the gameplay loop is addictive and rewarding. You can easily finish a run in a single sitting, and if you enjoy exploration this game is really worth checking out. Honestly I think the $10 list price is fair—that's less than the cost of going to the movies, and will entertain you for about as long. But if you see this go on sale, you owe it to yourself to pick it up. You can pick up Minit on PC, Nintendo Switch, Xbox One, or Playstation 4. Now my question for you—have you ever played Minit? What did you think of it? How important is length for video games? Let me know in the comments section!